On the Saturday while I was in Miami, I drove up to Fort Pierce to meet with Stan Dabney and take a look at a Valiant 40 sailboat he had listed through his brokerage, Offshore Atlantic Yachts, Inc. Stan is one of the founders of Valiant Yachts, and no one knows that boat or its history better than he does. 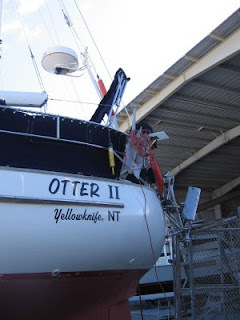 The boat we looked at was Otter II, a 1979 centerboard model that is currently owned by Bruce and Phyllis from Yellowknife in the Northwest Territories. They had just spent thirty days sailing up from Panama, and Phyllis, who was on hand to show the boat, said they had taken a pounding beating upwind in heavy seas. You wouldn't have known it to look at the boat, which was in immaculate condition. I had studied the listing on YachtWorld.com carefully, but text and photos didn't do her justice. Coming directly from the Caouettes' Valiant 40, which is crammed to the gills with stuff, Otter II looked almost austere. In place of the standard teak, there was light-colored Formica on most of the vertical surfaces, which brightened the interior dramatically. The original plastic hatches had been replaced with steel ones and the woodwork was freshly varnished, making the boat shine all the more. The navigation station was nicely laid out and well organized. There was an SSB radio but Phyllis said they had not had success with getting it set up for use with email. The radar screen could be viewed easily from both the station and the cockpit. One feature I was curious about but couldn't figure out from the listing was the centerboard's workings. 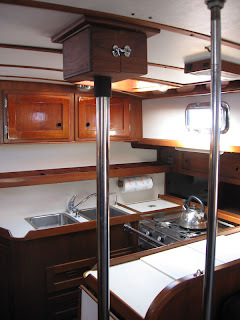 The Valiant 40's off-center companionway allows the cable that raises and lowers the centerboard to run through the boat's centerline, making it relatively unobtrusive. There is a separate steel pipe next to the one that acts to connect the deck to the hull just aft of the mast. Where that pipe meets the cabin ceiling, there is a teak box containing a block which redirects the cable coming through the pipe to a winch located at the cockpit bulkhead. According to Phyllis, it takes exactly thirty turns of the winch handle to completely raise or lower the centerboard; there is no easy way to gauge its intermediate positions. 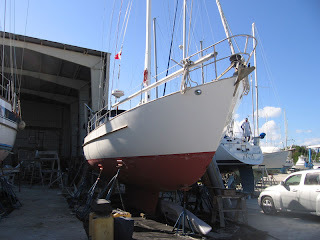 The listing showed photos of the boat hauled out, with the centerboard partially lowered, but in the boatyard where she is now sitting, the boat is resting on her keel with the centerboard fully raised. There were several nice features topsides. The mast-furled mainsail is operated electrically, making reefing as simple as pushing a button. There is a small crane for raising and lowering the heavy dinghy outboard and for moving heavy items like fuel tanks and batteries in and out of the boat. 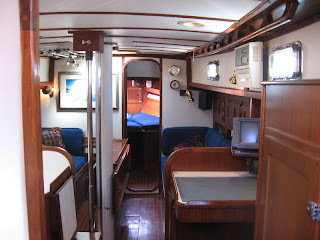 The cockpit has a nicely designed folding binnacle table, a propane barbecue on the stern rail and a booster step behind the wheel for extra height when looking over the dodger. The only negative aspect of Otter II is that she is a "blister boat," one of the Valiant 40s built by Uniflite between 1976 and 1981 that have a blistering problem in the fiberglass laminates. Stan pointed out the many small blisters on the hull and even chipped off a few with his thumbnail. They are more cosmetic than structural and can be repaired by stripping off and replacing the outer layers of fiberglass. Stan said that this is an expensive and unpredictable process in the United States but that when President Obama loosens restrictions with Cuba, it could probably be done there for about $5000, with a higher quality result. In addition to the blisters on their hulls, blister boats usually have blisters on their decks but there were none visible, so it is possible that the decks had been repaired at some point but I didn't get a chance to ask Phyllis for the details. All in all, Otter II is an excellent boat and an excellent value at an asking price of $95,000. These current economic conditions favor the buyer over the seller, but Stan says that sales have been especially slow in the last few months as people wait to see if the recession has bottomed out or if it will continue into the foreseeable future. If things turn around before too long and Otter II is still available, who knows what might happen? 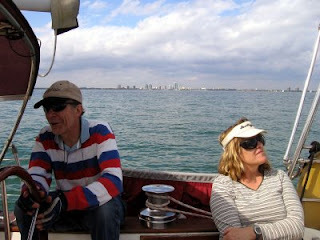 The trip to Miami to assist Paul and Honey Caouette with Wild Iris, their Valiant 40, was an eye-opener. 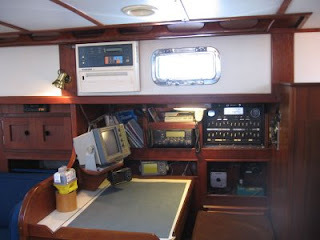 The previous owner had sailed her extensively for twenty years and accumulated a vast collection of tools and spare parts, and all of it is still on the boat. 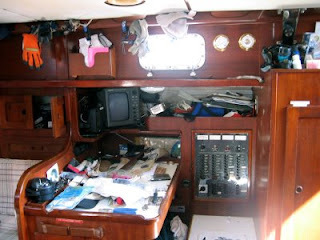 To say the boat is cluttered would be an understatement. It's like an overstuffed refrigerator, where you have to take armfuls of stuff out of it just to get to what you're looking for. The Caouettes have owned her for about four years now and they are still sifting through it all. Part of their problem is that they live and work in Denver, so they can only get down to the boat every other month or so. 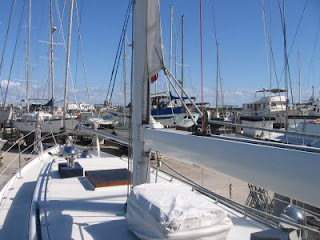 Another part of the problem is that to keep expenses down they are moored rather than slipped at the Crandon Park Marina in Key Biscayne, so there is no place to move anything off the boat except into the dinghy, but then there is no storage space to move it to after reaching shore. Still another part of the problem is that they stay on the boat while they are working on it, so every project must take into account that they will be eating, sleeping and trying to keep clean in the midst of ongoing chaos. Those are some serious impediments to preparing the boat for a May trans-Atlantic crossing, but Paul will be taking leave from his work starting in March in order to work on the boat full time. He plans to have it pulled out of the water in order to paint the hull and address any below-waterline issues. And he is planning to reduce the boat's weight by at least four thousand pounds by removing most of that heavy clutter. We had some difficulty with the diesel engine and power generation while I was there, so he will also be addressing those systems carefully to be sure they are working reliably. Finally, Paul and Honey will take a shakedown cruise up the coast to put everything to the test. Based on what little we were able to accomplish while I was there, Paul will need all of those two months to get Wild Iris ready. 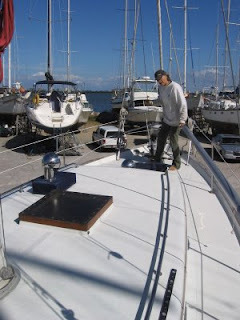 The days passed quickly as we worked on numerous projects, everything from installing a new mainsail and running some new wiring to repairing the dodger and doing routine maintenance on the winches. The highlight was getting to finally sail on the fifth day. We needed to field test the new sail, didn't we? 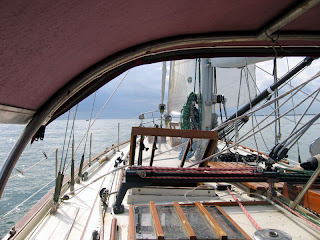 So we motored out into Biscayne Bay, put up all the sails--main, genoa and staysail--and then cut the engine. There were big smiles all around as we sailed out toward Stiltsville, until the wind died. We started up the engine again and turned around since it was getting late in the day. But then the engine started cycling strangely, so Paul shut it off, gave me a heading and went below to investigate. Fifteen minutes later, I ran us aground. 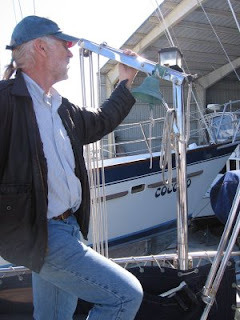 Completely ignoring the shallow-water warning marker about a hundred yards to port, I had doggedly kept us on Paul's heading, noting that the depth meter was showing a relatively safe four feet from the bottom of the keel, when there was a shuddering and the boat stopped moving. Instead of being angry, Paul and Honey shrugged as if running aground were a common occurrence. It turned out they even had insurance against it through BoatUS. Paul got on the VHF to summon a towing service, and within a half-hour we were safely back on our mooring. Aside from my role as unpaid labor, how do I fit into Paul and Honey's plans? Well, if things go as hoped, I (and maybe Nan as well) will be joining them for the first leg of their trans-Atlantic crossing, sailing from Miami to Bermuda. They have only one other crew member lined up for that leg at this point, so they really need the assistance, especially considering that if anything is going to go wrong, it will probably happen in those first several days. I'll keep you posted as plans develop. Today is Nan's birthday. I won't reveal her new age, but I will say that we made the most of her special day. After I made omelettes for breakfast and Nan opened her gifts, we went ice skating at the almost-new Glacier Ice Arena here in Grand Junction. Neither of us has skated in many years, Nan in about twenty and me in almost forty, since I discovered skiing at age ten. We were both a little nervous as we stepped onto the ice, which is much slipperier than either of us remembered. After a few tentative steps we were both gliding along, though a little unsteadily, with big smiles on our faces. We spent most of our hour on the ice holding hands as we skated around the oval dodging falling kids and trying not to fall ourselves. It was a blast, and we will definitely do it again. It’s my birthday, so don’t make me antsy! This year marks the beginning of the fifth year for my Whispering Jesse blog. Over the years, I have made little tweaks and adjustments to the layout, but one thing has never changed: Dots! When I first set up my blog, Blogger's Dots template looked fun and was somewhat in keeping with my nautical theme if you thought of the dots as looking like bubbles. But it started to get tiresome after a couple of years and I started looking for alternatives. I checked periodically to see if Blogger had introduced any interesting new template choices, but nothing ever caught my eye enough to justify changing from my old one. So Dots it has been but Dots it is no more! I was standing in the shower yesterday, thinking about my blog. Don't laugh! Like many people, I do most of my best thinking in the shower. I wondered why my blog's content was compressed into a narrow 700-pixel band down the middle of the screen when most people now have computer monitors with much greater resolution than the old 800x600 standard. Why couldn't I widen it a couple of hundred pixels or add a third column to the existing sidebar and main columns? When I was toweled off, I went to the computer to check Blogger's template offerings yet again. Nothing new. So I went to Google and typed in "3 column blogger templates". I quickly discovered that I was not alone in my frustration. There are all kinds of third-party developers out there putting their creativity into designing three-column blog templates. My great fear was that they would not be completely compatible with what I already had going, so I kept looking. I finally found an excellent blog post by a guy who calls himself Nitecruzr and is the brains behind The Real Blogger Status: "Making A 3 Column Template". Using the simplest of the existing Blogger templates, Minima, he explains how to edit the template to make it display three columns instead of the standard two. I set up a new test blog in order not to screw up my existing blog and tried it out. It worked perfectly on the very first try. The main column was a little squished but I experimented with the settings until I had a serviceable-looking 900-pixel blog with a 450-pixel main column and two 200-pixel sidebars. Then it was decision time. Was I ready to give up on Dots for this new look? You bet I was! As you can see, the new look is a huge improvement. The endless collection of stuff that was in the left sidebar is now distributed between the two sidebars, with the text, photos and widgets on the left and all the advertising on the right. Hey, can you blame me for trying to get a little more out of blogging than simply the joy and satisfaction of sharing my life with my readers? If you were wondering, the photo in the banner at the top is one I took during our 2004 sailing trip in the British Virgin Islands. It shows the mooring field at Cane Garden Bay on the north side of Tortola. The sun is setting behind Jost Van Dyke, the small island to the northwest of Tortola. I welcome your questions and comments and will reply as best I can. Happy New Year! Google Maps is one of the most useful tools I have found on the Internet. 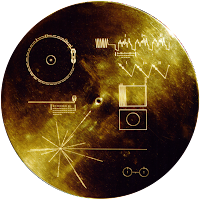 I have been using it for about three years for everything from figuring out the shortest driving routes for road trips to looking at satellite views of the pyramids of Egypt. But most of the time, I just use it to fantasize about the places where I would like to go. Even if I never visit them all, at least I've improved my understanding of geography. Until today I never bothered to check out the My Maps feature. It allows users to create their own custom maps with points of interest, routes, photos, videos and other content, and then to share their maps with others. Of course, as a sailing dreamer, the first thing I did was to lay out a circumnavigation route--not the one I have been dreaming about lately, which will appear in future "Circumnavigation Routes" posts, but the one I came up with in 2001. Here is a link to it: Circumnavigation Route 2001. Back when I was working for the Aspen School District, I had a giant National Geographic map of the world on the wall in my office and I would spend odd moments staring at it and figuring out where I would sail if I ever had the chance. Since it was pure fantasy, I wanted to sail absolutely everywhere, with the idea that I would never see some of the places if I didn't include them in one incredibly ambitious circumnavigation. So remote places in the Pacific Ocean, like the Galapagos Islands, Robinson Crusoe Island, Easter Island, and Pitcairn Island from Mutiny on the Bounty fame were naturally on the list, as were most of the Mediterranean port cities of Europe. I had recently finished climbing all of Colorado's 14,000-foot peaks and was looking for new climbing challenges, so the four peaks of the Seven Summits (the highest peaks on each of the seven continents) that I would encounter along the way--Cerro Aconcagua, Mount Kosciuszko, Mount Kilimanjaro and Mount Elbrus--were also on the list. Since my parents own a vacation home near the ocean in Savannah, Georgia, that was my logical starting and ending location. The circumference of the earth is about 25,000 miles but according to Google Maps, my "Around the World" route would be a little more than twice that distance. That's an awful lot of deviation from the shortest possible distance, and it doesn't even remotely take into account the prevailing winds or weather conditions, which I knew little about when I was planning it all out. I have studied other circumnavigators' routes, from Joshua Slocum's to Robin Lee Graham's, and they seem to average about 35,000 miles and take about five years. Applying the math, my route, if it was not impossible to complete, would take at least seven years. But most of those other voyages were continuous, with quick landfalls for reprovisioning. What if we decided to spend a year in France? That is why I think of this dream, as I have mentioned in previous "Circumnavigation Routes" posts, as a for-the-rest-of-my-life experience rather than as just another accomplishment to be checked off the "life list." As they say, the journey is the reward.